It is common knowledge that one of the most important, and most famous, aspects of Italian culture is its cuisine. 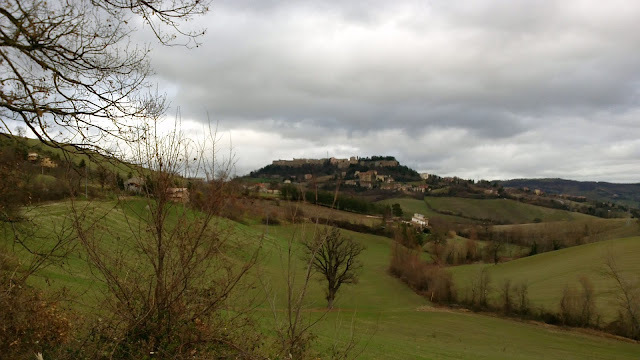 So, it is only fitting that as students studying here in Italy, we not only learn about this cuisine and what it means to Italy, but also to learn first-hand how to make it for ourselves. In the class Florence for Foodies, a series of four cooking classes at the Giglio Cooking School in Florence, we have not only learned how to make a wide variety of different Italian dishes, but we have also (and thankfully!) been able to eat the fruits of our labors. Everyone together in the kitchen chopping, boiling, stirring, cooking, baking, and finally sitting down to eat all together, has made for some of the most fun and memorable evenings of the quarter. Our first lesson focused on flour and gluten, where we learned that gluten is the integral protein of wheat that keeps the pasta noodle bound together and strong after it is cooked. We also learned that there are two types of flours: durum wheat semolina (used for pasta) and tender wheat flours (generally used for cakes and breads.) We got the chance to make our own fresh pasta, which was surprisingly easier than I have always believed. All that is required is semolina flour, egg, and salt. However, it does require a bit of muscle strength to roll out the dough perfectly, until it is ready to be pressed and cut by the pasta machine. We made lasagna from scratch with our homemade pasta, layered with béchamel sauce (a sauce of butter, cream, flour, cheese, and nutmeg) Parmesan cheese, and a homemade ragu meat sauce. We learned to chop the vegetables for the ragu incredibly fine, so that they cook down to a puree when added with the tomato paste and meat. For dessert, we made an absolutely incredible and flavorful cake; an olive oil cake flavored with lemon and orange zest. We tested our skills by making a wine caramel for this delicious cake, being extra careful as to not burn the sugar and keep the caramel at exactly 108 degrees Celsius. When we finally sat down at the end of the first class to eat our meal, we were all pretty surprised that we had been able to make something so delicious absolutely from scratch! Our second course was a dish of “pesce crudo,” or raw fish. 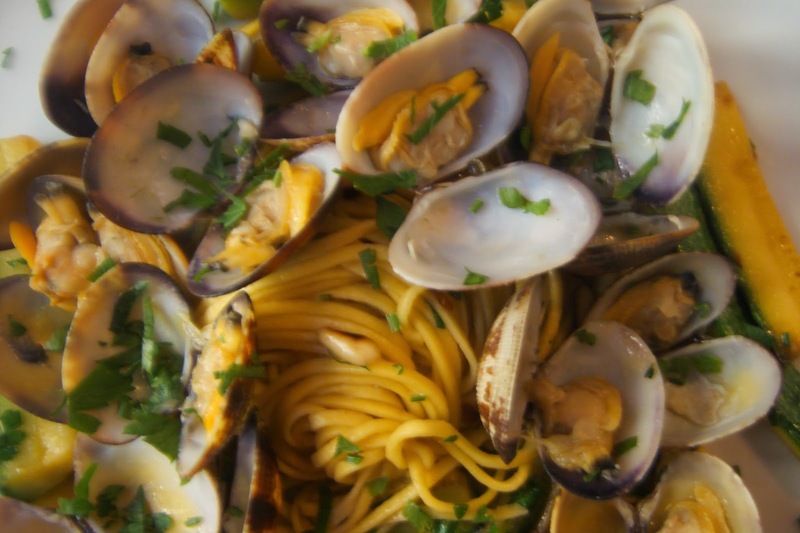 Raw fish is commonly thought of as being a strictly Japanese dish, but this is not the case; Sicilians have been eating raw fish throughout their history. We prepared and skinned tuna and sea bass, dressing it with vinaigrette of lemon and orange juice (from which the acid keeps the fish fresh) and ginger. Served on a bed of arugula, this fresh and light dish was extremely delicious. Everyone that had not tried raw fish prior to this class was adventurous, and tasted some for themselves, and most found they actually liked it! 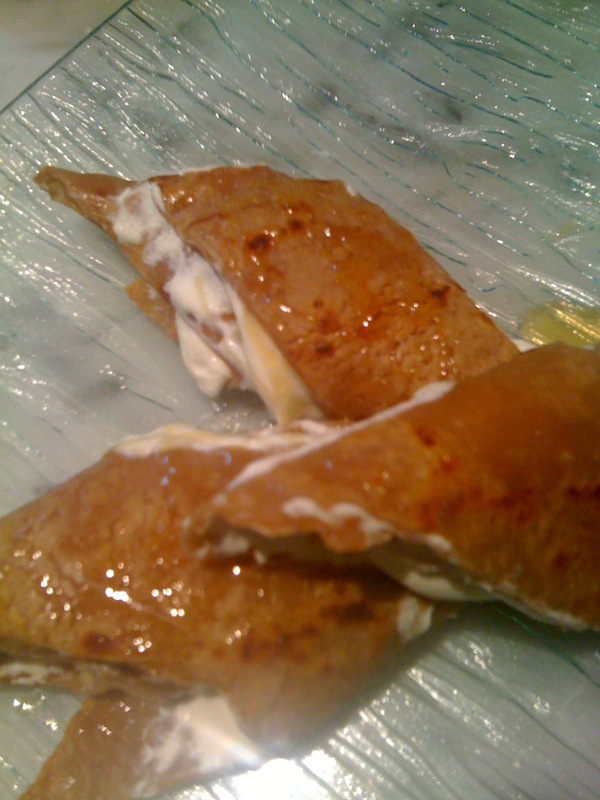 Finally, for dessert, we made crepes of chestnut flour, filled with fresh cream and ricotta and drizzled with honey. These crepes had a delicious and unique flavor from the chestnut flour, and they were not too sweet, as no sugar was added to the filling, which brought out the natural sweetness from the honey. Our third lesson was centered on diversity in Italian cuisine. We prepared pasta with meatballs for our first dish, after stopping to think whether meatballs are technically an American or Italian dish. These balls are called “polpettine,” meaning that the balls are the size of a bite, and not nearly as large as the average Italian-American meatball to which we are accustomed. In fact, many of typical “Italian” dishes in America are not found in Italian at all, such as Fettuccine Alfredo, Pepperoni Pizza, or Chicken Parmesan! We made our meatballs by rolling pork, beef, Parmesan cheese, and parsley into small balls and sautéing them in a pan. To the sauce we added minced carrot, onion, and celery, tomatoes, and a hefty dose of red wine. In addition to the spaghetti with meatballs, we ate chicken breasts stuffed with cooked spinach, pine nuts, and Grana Padano cheese, and cooked in garlic, lemon, and white wine. Cutting the chicken breasts open, stuffing them, and tying them up with string proved to be quite the process, but one that lead to a delicious result. 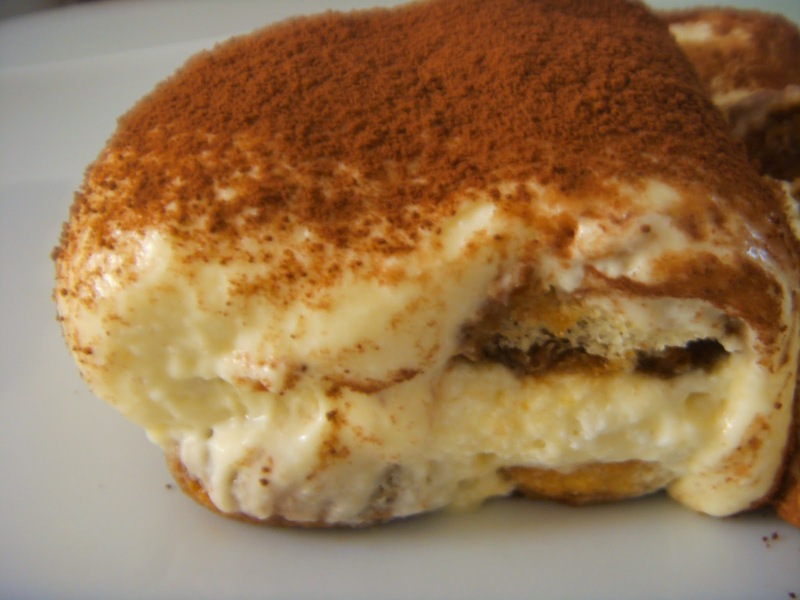 Dessert was perhaps the most classic of all Italian desserts: tiramisu! This was made by soaking lady-finger biscuits in strong Italian coffee, layering the biscuits with mascarpone cheese and egg cream, and then adding a final dusting of cocoa powder on top. While technically a tiramisu needs at least 6 hours to set in the refrigerator, we made due with 2 hours in the freezer, and it turned out just as sweet, creamy, and absolutely fabulous. Our last class focused on vegetarian cuisine and cooking as a form of education. Food is meant to be nourishing, nutritious, and fueling for our bodies, and hopefully using ingredients from local and sustainable sources. These themes were highlighted in the fresh ingredients we used during this class. We cooked a traditional Sicilian dish for our first course, Caponata, which was created by Sicilian women to feed their fisherman husbands as they were out at sea. Because of the vinegar and sugar added to the Caponata, it can be kept fresh out of the refrigerator for a few days, so it would not spoil while the men were on their boats. To prepare the Caponata, we had use all of our arm strength to wring every last drop of water from the eggplant so that it would not fill with oil when fried. We sautéed a combination of blanched and cut tomatoes, red onions, olives, pine nuts, and raisins (a combination of savory and sweet,) later adding fried eggplant and celery, vinegar, and a bit of sugar. The Caponata was full of flavor and perfectly cooked. Our second dish was risotto with artichokes. We made this risotto without cream or butter, toasting the rice first in olive oil before letting it absorb vegetable broth so that it would become creamy. To this we added artichokes, which we had to peel, cut, core, and soak before cooking them with parsley. We finished our meal with what, in my opinion, was the best thing we cooked throughout the entire course: poached pears, cooked in wine, with zabaione. We first poached the pears in a mixture of red wine, cinnamon, nutmeg, and honey. Then, we made the zabaione, a challenging sauce of whipped egg yolks, sugar, and white wine. The egg yolks had to be whipped with the sugar while on heat, but not to the point where they would get cooked and turn into scrambled eggs! Finally, we dressed the poached pears with the zabaione and a reduction sauce of the wine mixture, which was cooked down until it was thick and sweet. To be able to learn how to make incredible and authentic Italian dishes, all the way from scratch, and to work together to make them all come out (if I daresay) perfectly, made it all the more rewarding when we sat down to eat everything we had cooked. This class was incredibly fun and quite the bonding experience for all of us students as we spent 2 hours scurrying around the kitchen, everyone pitching in to make sure every job got done, all the while progressively getting hungrier as we awaited eating our feast. However, most importantly, this course gave me an entirely new appreciation for Italian cuisine. While I have always adored Italian cuisine and its emphasis on fresh, locally sourced, healthy, unprocessed ingredients as well as its ability to bring out such amazing flavor from the simple ingredients, I now have a sense of pride that I too have partaken in the beloved, upheld traditions known to Italian cooking. Now, I have learned first-hand that cooking Italian cuisine is so much more than just making a delicious dinner; it is truly a form of cultural art.